If you have family and friends who are unable to attend the 2019 Commencement ceremony, the ceremony will be live-streamed so they can enjoy it from afar! See the link at the bottom of this web page for information about live-streaming the event and access to previous years commencement live-streams. IMPORTANT: August candidates can be allowed to participate in the May ceremony of the same calendar year. (Commonly referred to as being allowed to "walk.") However, December candidates for graduation will need to wait until the following year’s ceremony to "walk." For example: an August 2019 candidate may participate in the May 2019 ceremony but a December 2019 candidate must wait until May 2020 to participate. This is a University-wide guideline that applies to all schools and colleges and is firm. Exceptions will not be granted. 7:30 a.m.– Candidates line up in the Field House and fill out name/photo cards. Immediately following the ceremony: Come to the Student Union Ballroom to have a free professional portrait taken of you by Defining Studios. It can be solo or with your family/group. You will receive one high resolution image (all rights released) at no cost to you and the option to buy other images or prints if you wish to do so. The line moves very quickly and free beverage service and light refreshments are available to you and your guests while you wait. *By tradition, the honor of carrying one of the two school banners goes to the highest cumulative GPA female student and highest cumulative GPA male student in the graduating class. 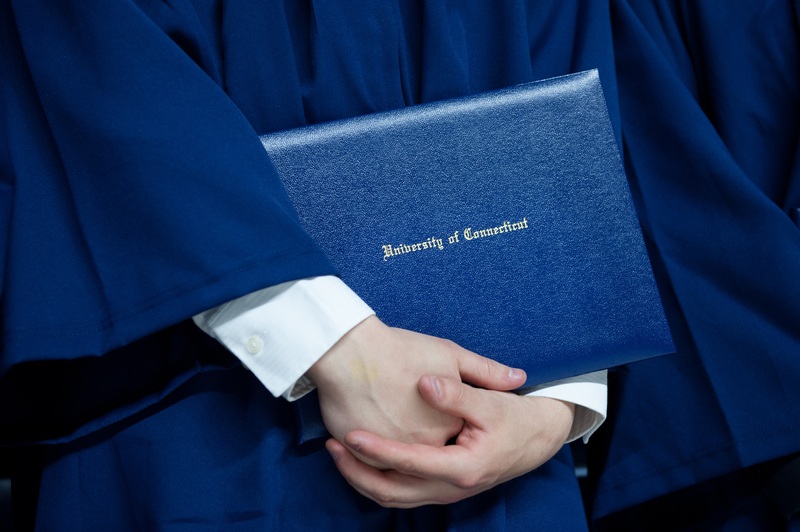 For your name to be included in this May's University of Connecticut commencement brochure, May and August candidates for graduation must have applied to graduate online through your StudentAdmin (PeopleSoft) account in the first four weeks of the spring semester. If you miss this deadline your name will NOT be in the program. Do not wait to "apply for graduation" until you are ready to file your final plan of study. You can apply to graduate separate of this requirement. Please read all of this publication carefully. It was designed to ensure that you, your family, and guests have a memorable day in celebration of your academic achievement. The School of Engineering requests your full cooperation in adhering to ALL of these instructions so that Commencement is enjoyable for everyone. Please note that there will NOT be a rehearsal. On Commencement day, check in at the Field House no later than 7:30 a.m. At the Field House you will be provided with a card to fill out. This card will be used to call your name as you receive your diploma cover and to match your name with your photos. Please fill it out neatly and completely. Marshals will assist you in lining up and will lead the procession into Gampel. You will be seated in sections we have reserved for students by major. You will walk onto the floor (basketball court) to be congratulated, receive your diploma cover from the Dean or Associate Dean, have your photographs taken, and then you will return to your seat for the remainder of the ceremony. Your actual diploma will be mailed to your permanent home address a few months after Commencement. WE EXPECT YOU TO REMAIN IN YOUR SEATS until the ceremony has concluded and the Faculty have recessed. The School of Engineering Student banner carriers will lead you out of Gampel. THE CEREMONY IS EXPECTED TO LAST APPROXIMATELY TWO HOURS. All students are required to wear the UConn undergraduate cap and gown to Commencement if they wish to participate. No exceptions will be made to this rule. You are not required to participate in Commencement - it is optional. To participate you must purchase your cap and gown at the UConn Bookstore. You will be wearing a UConn BLUE cap and gown (not black.) Once they go on sale, they will be available for purchase until the day of Commencement. As it gets closer to May, there WILL be long lines to purchase these items - so, purchase yours as soon as you can. You must wear proper attire under your graduation gown. Mortarboards are NOT optional and should be worn straight. Tassels should hang from the right side when you enter Gampel, to be moved to the left during the ceremony when you are told to do so. Out of respect for the nation, all candidates are asked to stand (for those who are physically able to do so), be attentive and silent during the singing of the National Anthem. All men are asked to remove their mortarboards during the singing of the National Anthem. Graduation tickets are distributed to students when they purchase their caps and gowns from the UConn Book Store ONLY. Each candidate can receive up to eight guest tickets when they purchase their cap and gown; this is the only way to receive the tickets. All guests aged 4 years (and older) require a guest ticket for entry to the ceremony. Tickets are bar-coded to guard against copies being made for sale or other unauthorized use. Candidates for Graduation do NOT need a ticket. If you are a December 2018 graduate who can not get to Storrs to pick up your cap and gown, call the Bookstore at (860) 486-3537 to make other arrangements. If you need extra tickets please send an e-mail to engr-ugcommencement@uconn.edu to be placed on a waiting list. Please provide your name and the number of extra tickets needed. Being placed on the waiting list is not a guarantee you will obtain extra tickets but we do our best to meet reasonable requests. Extra tickets will not be issued until a week or two before Commencement. We will notify the requesting student when the tickets are available. Candidates for Graduation must pick up their extra tickets in person from the Undergraduate Programs office (EII room 304) during the hours of 8am and 5pm, Monday through Friday. Bring your UConn ID with you, to our office, when you pick up extra tickets. Professional photographers will take photographs of candidates in front of the School of Engineering banner and as they are presented with their diploma covers. If you wish to receive a color proof, you must fill out the address card that will be provided to you in the Field House. Proofs will be mailed to the address you provide on the card. Tripods are NOT allowed in Gampel Pavilion. Members of the audience using hand-held cameras may take pictures during the ceremony from areas reserved for that purpose. To accommodate everyone, individuals are requested to use these areas for only a short time and then return to their seats. The School of Engineering is pleased to offer our graduates a complimentary, high-resolution, all rights-released image of you, or you and your guests. The picture will be taken by a professional photographer from Defining Studios during the family photo opportunity in the Student Union Ballroom immediately after the ceremony and until 1:00 pm. You can share or print the image, without limits, once you receive it. You can also order professional prints of this image or candids taken on Commencement Day from Defining Studios (http://www.definingphotovideo.com). A representative from Defining Studios will provide information on how to obtain your complimentary photo. Traffic into the Storrs area is extraordinarily heavy on Commencement Day; please allow plenty of extra time. Parking will be available at no cost in the North and South Parking Garages on Commencement Day. Shuttle buses will run from parking lots F, X, 9, and S to and from Gampel for the duration of Commencement Day events. While guests are waiting for the ceremony to begin, we will run a slideshow of the graduating class in Gampel on the Jumbo TVs. Candidates are offered the opportunity to submit a slide to be included in this slideshow. Students will be notified well in advance of how, where, and when to submit the slide. The deadline for submission is set by Gampel personnel. We must have it emailed to: engr-ugcommencement@uconn.edu by 11:30 pm on Sunday April 14th. Students missing the deadline will NOT have a slide included in the slideshow. To prevent others from submitting a slide you have not approved, (even well-intentioned parents who love your baby picture!) the slides must be submitted by the student from their UConn email account. The slide must meet ALL of these conditions: •	jpeg or png format, cropped to exactly 1920 pixels wide by 1080 pixels high (landscape orientation) •	Picture must be of the candidate ONLY - no group shots (blurring the faces of any people in the background is fine) •	You can use a professional head-shot but it is not expected. Picture can be a candid - you doing a hobby, traveling, working, etc •	A caption is required ON the slide with: first and last name, major, and hometown (any font and size that fits). No other information can be included. •	Appropriate for family viewing *Most students use a portrait oriented picture and put a banner with the information we require to "fill in" the slide and make it LANDSCAPE orientation.Please remove "red-eye" if you can, this looks very bad on the jumbo TVs. Please don't s t r e t c h your picture - this produces odd looking results. Alcohol is not permitted at the Field House or Gampel and will be confiscated before entry. 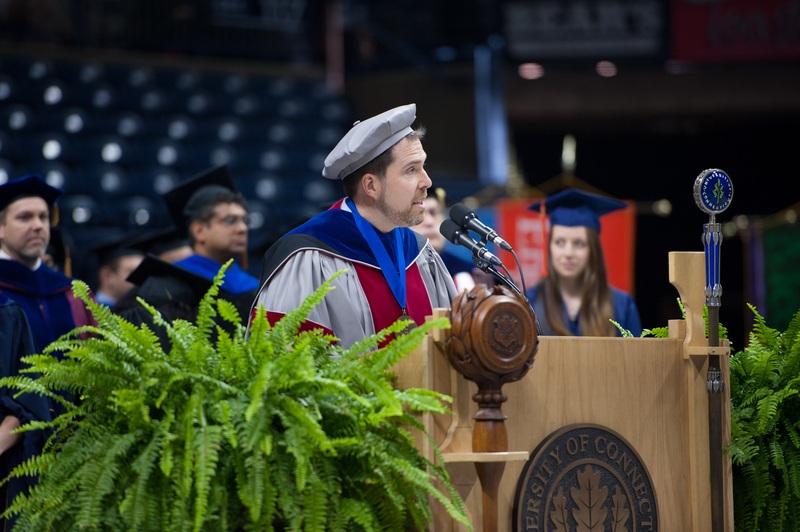 Additional details, including helpful FAQs, may be found on the following website: University: http://commencement.uconn.edu Or you may e-mail or call for additional information: commencementoffice@uconn.edu or 860-486-6800. ***Further information on graduation slide submission guidelines can be found here. Thank you in advance for your cooperation and CONGRATULATIONS! We hope that you, your family, and guests have an enjoyable day on campus as you celebrate this momentous academic achievement.